At the moment it’s hard to find people in the department - the old version of the people finder is rarely used and most people rely on the Global Address List in Microsoft Outlook. Both are hard to keep up to date, and so are often inaccurate or missing important details. The new tool is in its early stages but we're already using it in our team to stay connected. The tool allows users to add their contact details, job description, skills and expertise, but also upload a photo - which cuts down on 'blind dates' when you're trying to track someone down in person. We're rolling out the service across the department and have started by inviting colleagues in the HR and Technology teams to create their own personal profiles. The biggest challenge in rolling out the new tool is ensuring that all the information on staff is accurate. We're pursuing a number of strategies to get hold of this info, with the minimum that we’re after being a name and email address. In order to keep the tool up to date and accurate, the new people finder is entirely self-managed. This means users can easily update their own profiles, but also correct their colleagues' pages, or ask for more details if any info is missing. 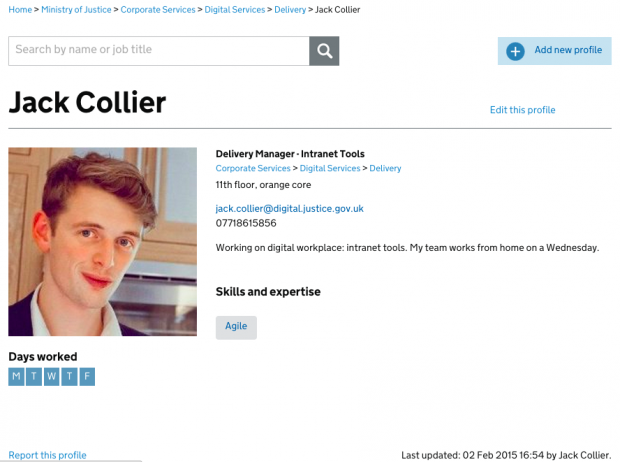 By creating a personal profile, you will help build a much more accurate, up-to-date service for colleagues to find and contact you and understand your role. We've also made it a lot easier to search and browse through the records. The more information you can give about yourself and others, the better the service will be for everyone. The top thing that users search for, however, is a phone number. An example of a team page. All pages can be edited by anyone, allowing the new people finder to be more easily maintained. Please contact people-finder-support@digital.justice.gov.uk if you want to find out more or are interested in helping us out. To keep up to date with what we're up to, follow us on Twitter @MOJDigital. Thanks Jason, really appreciate your comment - we'll certainly keep you posted :). One of the challenges we're solving at the moment is how to keep it up to date for the long term. The process to update the old system was cumbersome and restricted, as a result, more often than not the information was inaccurate and people lost faith in the system. With the new People Finder, users are now able update the system themselves as well as allow others to do it for them, in real time. - This is still to be reviewed and iterated though so we'll let you know how it goes! Interesting stuff! When you say "most people rely on the Global Address List in Microsoft Outlook" - does your new Profiles tool link to and update that as well? I expect most people will still continue to use both tools depending on which is most convenient/appropriate at the time. I'm thinking about this in context of my own organisation (a local authority) where we also have a new/recently developed Profile tool - name, email, phone, job title, roles/responsibilities, location and manager/colleagues (no departments, teams or photos yet). Name, email and phone are linked to Active Directory and are shared with Outlook and Lync (IM/presence tool) but nothing else is so Outlook/Lync will continue to hold potentially outdated (or missing) information on job titles, managers, departments and teams even though Lync is a really useful extension/shortcut to finding someone. Thanks Stephen. Our MVP is purely to have a staff directory that includes 100% of staff with a minimum amount of useful information. Once we've achieved that (mammoth) task, we can begin looking at integrating etc, which I agree would be really useful for users. 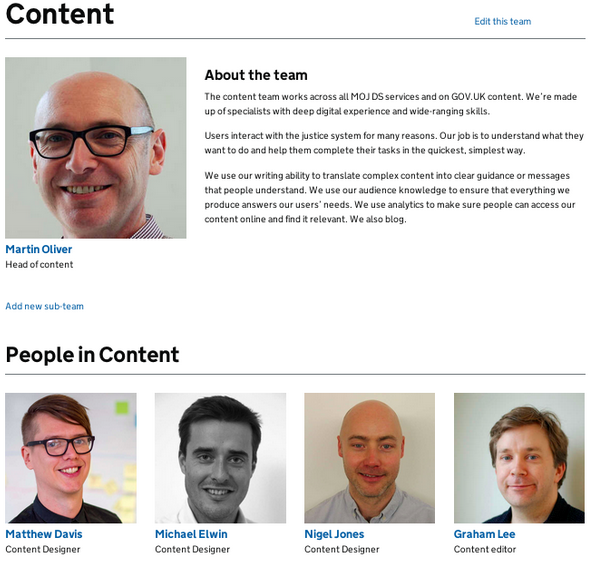 Creating a good staff directory seems to be one of the biggest challenges for any intranet development. We are currently working on a new intranet platform for our merged agency that includes a self service staff directory. The challenge of getting people to register on the site with their details is probably the biggest factor holding us back from adopting it as the single source of information. What are you doing to encourage people to register? It would be good also to have a chat about your experience to date in developing an intranet on wordpress as we are just coming up to our year anniversery of our soft launch and maybe an exchange of ideas may be beneficial! People lie at the heart of the issue of creating an up to date database. One way that we've tried to ensure that the database is up to date is to ensure that anyone and everyone can edit almost everything. We also have other tricks up our sleeve to encourage this. Getting people to sign up in the first place, however, is very tricky. We have pretty much proven that an organic roll out ('here's the link, sign up') won't work, even with a moderate amount of hand holding and where proactive people can add other people to the system. We're, therefore, looking to amalgamate existing databases, such as the payroll database, to provide us the minimum data to seed the directory - a name and email address. Once we have this, we can prompt people to actually update their details. The problem for the MOJ is that, as an amalgamated department of 70,000 people, it is proving tricky to get that minimum data. Hi Jack - the people finder looks great! I've just tried to email "people-finder-support@digital.justice.gov.uk" but got a bounce-back. Is there another email address I could try? I love the concept but I’m not sure it’s so very different from an agency mechanism. I worked at a catering agency recruiting event staff in London for 5 years and we used all kinds of online database systems to transpose potential staff. I would recommend you check it out to get an idea of what is being utilized now (google jobs 2 go) you will see it’s not a million miles from what’s being promoted here. I’m not there anymore as I left and started my own business and we build these kinds of systems for companies worldwide now. Hi, have you tied plugging in the WP staff directory with the Active Directory, so staff profiles are automatically updated? 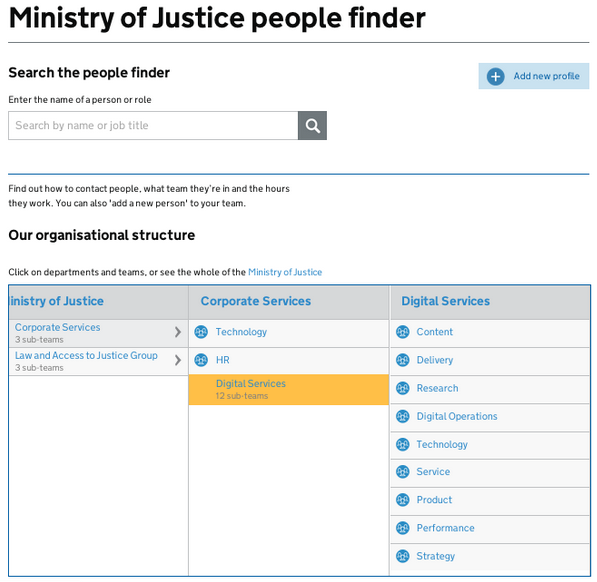 * The AD's also are terribly inconsistent and out of date to the point that there are records of people in there, that haven't worked at the MoJ in years. * There would have been severe architectural constraints and information assurance processes that would need to be undertaken to allow interaction of a service like this to interact with internal AD's, due to the current hosting environments and the constraints imposed. * Remember, in order for this to work all of the AD's involved would need to be the source of truth for their respective records. We could of simplified the model, by allowing only a uni-directional flow of information where People Finder merely pulls data from AD. But then what about updates/deletions? Do we allow updates of user information through the service? What are the security implications of this? Should we impact user experience and risk the data becoming out of date by implementing a two stage workflow for updates, with the first being some fields to be editable via the service interface while others such as name/contact details only updatable via the current change request process? * There's also the problem of how, in various departments there are people who've been loaned from other government agencies to assist on projects. If we were to rely on AD, those people would sadly not be present or accounted for. I hope these points answered your question. As you can see AD on the surface would from a simple technology stand point appear to be the answer, but from a security and organisational perspective this would have created a rabbit hole way beyond the scope of a staff directory service. Hi - just wondering how this is progressing and how (if at all) you ask people to express their skills and expertise. Is there, for example, a grid to fill in, prompting people to enter, say, qualifications, languages spoken, committees sat on, membership of professional bodies. Here in Welsh government, we've had photos in the internal directory for a while, so no blind dates, and it's connected in some way to our HR system, so job titles and position in the food chain seems to pull through automoatically. What's not so good though, is the space that people are expected to complete themselves, because it's a simple text box, with not much in the way of prompts as to what's expected. I ask myself, for example, can I search the directory for a colleague who can speak Polish, or who has knowledge of nuclear power. It would be interesting to hear how this project is going, from a potential users perspective I have to be honest and say I've not used it since creating my profile. It suffers from the same problem as the current people finder in that it relies on users to update their own data. Doing so will never provide a single point of truth for an address book alone. It either needs to be automated or users incentivised. Taking one high profile example, our former Perm Sec is still listed rather than her replacement. Other than Digital colleagues, most users have an access to a substantial global address book for their organisation, the user data may sometimes be flawed but, as a minimum, you'll have an email address that you can use to contact someone. Going outside the domain is more difficult of course, especially where colleagues don't put their phone numbers on their email signature but most colleagues operate within their own domain most of the time so these tools require them to update a profile mostly for the benefit of folks who do not have access to the GAL. To add to the problems, building a tool that requires you to request a link every time you use it and which has a google login doesn't appear to work with @justice Google accounts is too high a barrier for most people to even use it let alone update their data. We're asked to create a huge number of profiles these days from HR systems to Yammer, I'm convinced there's a solution out there but which leverages one of these sources in a way that's more efficient than what we've tried so far.